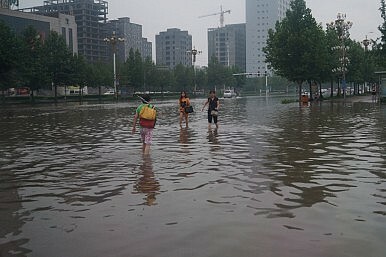 Flooded streets in Shahe, China in 2013. Devastating floods swept across southern China last week, causing at least $8 billion in damages. Much of southern China has been hit by torrential rains and severe floods since April. The weather has brought 260 millimeters of rain, along with winds measured at speeds of up to 200 km (125 miles) per hour, over the past week. To date, at least 186 people have died from the floods, which are affecting 32 million people across 26 provinces and municipalities. The government estimates an economic loss of more than 57 billion RMB ($8.5 billion), but this figure is expected to climb. The city of Wuhan was on red alert after the passing Tropical Storm Nepartak brought heavy rainfall that all but submerged the city. In neighboring Anhui province, alligators became another added danger as they escaped from a farm thanks to the flood waters. Public transport has been in disarray with 341 trains in Fujian Province alone cancelled, according to Xinhua. Many more southern train lines are severely affected, leaving many stranded or with extensive delays. The water levels of about 100 rivers in the provinces of Hubei, Jiangxi, Hunan, Jiangsu, Guangxi, and Guizhou have all exceeded warning levels, according to the South China Morning Post. From the optimistically cautious tone about its automatic flood surveillance system that monitors the Yangtze River (introduced as a measure against future floods in the wake of the deadly 1998 floods, which lasted for two months, affecting 220 million people, and killing anywhere between 3,000 and 5,000 people), and heroic narratives about the mobilization of the PLA Army in flood affected areas, the Chinese flood authorities started to change their tone last week. Beijing issued a warning of further disaster after the first typhoon of the season hit Fujian Province last week. The current weather patterns are not surprising given the shift in the global El Nino Southern Oscillation (ENSO) weather patterns, which is affecting much of the Asia-Pacific, and the trend towards global warming, according to Dr. Liu Zhonghui from the Department of Earth Sciences at the University of Hong Kong. “In general, it is much drier in northwestern China while wetter in southern China… Southern China may be indeed affected by the ENSO this year. Some studies support the notion that when [the] climate is getting warmer, the south is getting even wetter,” Liu told The Diplomat. In addition to natural weather patterns, China has a long history of corrupt government-backed projects that exacerbate natural disasters. According to a local Wuhan news report in 2014, an official responsible for a 1 billion RMB dike construction project between 2005 and 2013 was charged with taking bribes of 1.6 million RMB. One dike, which should have been upgraded as part of the project, was breached by the flooding last week, according to Chinese language news portal Sohu. The worst is yet to come, it seems. There is a strong chance that the Yangtze will see even more flooding should downpours strike the upper reaches of the river, said Chen Guiya, deputy director of the Yangtze River Water Resources Committee, according to China Daily. Authorities expect peak flooding to occur in late July or early August. Does China Still Want to Be a Global Environmental Leader?The Climate Change Promise of China’s Belt and Road Initiative12 Regions of China: The Central SouthCan China Live Up to Its Climate Fighting Promise?What Did China Say After US Announced Exit From Paris Agreement?